A pair of carnelian agate earrings with 9ct gold ear hooks. Here we have a lovely and very wearable pair of earrings made of brownish red coloured Carnelian agate in the bombe shape that was very popular around 1890 - 1910 - although these are a more modern version. Genuine Carnelian, faceted pear-shape briolette, dangle drop earrings. The colors are rich and have lovely facets. Ear wires are sterling silver French-style hooks. Total earring dangle is: 1-3/4". Gemstone : Carnelian (Genuine). Earrings (3841). Gemstone Shape : Heart. Gemstone Size : 10 x 10 mm. Gemstone Total Carat Weight : 7.5. Earrings Weight : 3.5 Grams (Approx.). Finish : High Polished. Brooches (6). 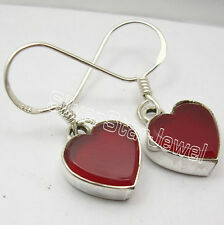 925 Stamped Solid Sterling Pure Silver CARNELIAN ETHNIC Earrings 1.2"
Gemstone : Carnelian (Genuine). Earrings (3841). Earrings Weight : 3.4 Grams (Approx.). Finish : Oxidized. Brooches (6). Cufflinks (7). Gemstone Total Carat Weight : 1.8. Gemstone Shape : Round. Gemstone: Carnelian (Genuine). Started in 2000, SUNRISE JEWELLERS (Indian Silver Jewellery 925) Us has flourished into one of the top manufacturers & exporters for gemstone studded silver jewelry & Sterling silver jewelry without gemstones. Gemstone : Carnelian (Genuine). Earrings (3841). Gemstone Shape : Oval. Earrings Weight : 3.9 Grams (Approx.). Gemstone Size : 6 x 8 mm. Anklets (1). Finish : Oxidized. Brooches (6). Gemstone : Carnelian (Genuine). Earrings (3841). Gemstone Shape : Square, Fancy. Earrings Weight : 6.7 Grams (Approx.). Why Buy From Us. Add to Favourites. Gemstone Size : 4 x 4, 10 x 20 mm. Bracelets (115). Gemstone: Carnelian (Genuine). Gemstone Size: 8x12 mm Pear Cabochon. Started in 2000, SUNRISE JEWELLERS (Indian Silver Jewellery 925) Us has flourished into one of the top manufacturers & exporters for gemstone studded silver jewelry & Sterling silver jewelry without gemstones. BA Suarti Sterling Silver & Carnelian Stone Earrings. Gemstone : Carnelian (Genuine). Earrings (3841). Gemstone Shape : Oval. Earrings Weight : 5.7 Grams (Approx.). Finish : High Polished. Brooches (6). Gemstone Total Carat Weight : 12.2. Cufflinks (7). CARNELIAN Sterling Silver 925 EARRINGS (011017). You are viewing a beautiful pair of Afghanistani Carnelian earrings set in a very stylish Sterling Silver design. Size of Carnelian : 4 x 6 mm. 925 Solid Silver RED FIRE CABOCHON CARNELIAN GORGEOUS CELTIC Earrings 1"
Gemstone : Carnelian (Genuine). Earrings (3841). Earrings Weight : 6.8 Grams (Approx.). Finish : High Polished. Toe-Rings (5). Brooches (6). Gemstone Total Carat Weight : 12.2. Gemstone Shape : Oval. Slender and elegant shiny Green Carnelian chain drop earrings in 9ct gold. Earrings are marked 375 for 9ct gold on the wires. The chains are 9ct gold mini belcher rolo style chains. These were inspired by the Retro period of the 40s. This remarkable set of earrings are crafted in gorgeous rich 14K yellow gold and feature 2 genuine approx. Anyone will enjoy this wonderful set of earrings. Perfect addition to any jewelry collection! Carnelian Cabochon set in Silver. Hooks for Pierce Ears. Sterling Silver. I have lots to list - having a tidy up. Cabochon drop 1.5cm. 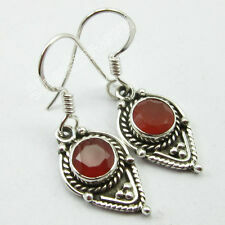 925 PURE Silver CABOCHON RED CARNELIAN Beautiful ANCIENT STYLE Earrings 1.4"
Gemstone : Carnelian (Genuine). Earrings (3841). Earrings Weight : 4.0 Grams (Approx.). Gemstone Size : 7 x 7 mm. Cufflinks (7). Gemstone Total Carat Weight : 2.8. Gemstone Shape : Round. Necklaces (106). MiriamL Handmade Jewelry. Carved Shell, Carnelian, Freshwater Pearl, 14K Rose Gold Bead Pendant. Carnelian Beads. 7mm Carnelian Beads. Carved Shell. 52 x 23mm Carved Shell Leaves. 14K Rose Gold Beads. 2 Stone Designer ! 925 Sterling Silver RED FIRE CARNELIAN Dangle Earrings 4 CM. Gemstone : Carnelian (Genuine). Earrings (3841). Gemstone Size : 6 x 12, 6 x 9 mm. Gemstone Shape : Marquise, Drop. Gemstone Total Carat Weight : 7.0. Gemstone : Carnelian (Genuine). Earrings (3841). Gemstone Shape : Drop. Gemstone Size : 13 x 18 mm. Gemstone Total Carat Weight : 20.0. Earrings Weight : 5.1 Grams (Approx.). Add to Favourites. Necklaces (106). Gemstone : Carnelian (Genuine). Earrings (3841). Earrings Weight : 1.7 Grams (Approx.). Gemstone Size : 7 x 7 mm. New Arrivals. NEW ARRIVALS (1154). Toe-Rings (5). Finish : High Polished. 925 Sterling Silver CARNELIAN Cut Gemstone BESTSELLER Pyramid Earrings 1.1"
Gemstone : Carnelian (Genuine). Earrings (3841). Gemstone Size : 7 x 14 mm. Gemstone Shape : Fancy. Gemstone Total Carat Weight : 5.0. Need Assistance?. Earrings Weight : 3.1 Grams (Approx.). Why Buy From Us. Faceted carnelian in fantasy cut. a pair of earrings. Hauptstein Karneol. Gesamtgewicht in Karat unbekannt. Nebenstein Markasit. EAN Nicht zutreffend. Hauptsteinfarbe Braun. Verschlüsse Hakenverschluss. 925 Sterling Silver CABOCHON Red CARNELIAN EXOTIC Cushion Earrings 1 1/8"
Gemstone : Carnelian (Genuine). Earrings (3841). Earrings Weight : 4.5 Grams (Approx.). Wholesale Lots (28). Finish : High Polished. Brooches (6). Gemstone Total Carat Weight : 12.4. Gemstone Shape : Square. For sale are these Native American Sterling Silver Carnelian Drop Earrings Weighs 2.9 grams combined. Measures 4.9cm long by 7mm wide (at widest point), approx. In good pre-owned condition. May require a polish as silver does naturally tarnish. FREE UK POSTAGE & DISCOUNTED INTERNATIONAL POSTAGE!! I also have items for auction. I will be happy to combine postage. If you have any questions please ask. Thanks for looking !. Gemstone : Carnelian (Genuine). Earrings (3841). Wholesale Lots (28). Earrings Length : 3.4 cm including hook ( 1.3" ). Earrings Weight : 4.5 Grams (Approx.). New Arrivals. NEW ARRIVALS (1154). Cufflinks (7). Earring Material: Carnelian(10x8mm). Earring Material: Citrine(12mm). Silver Type: 925 Sterling Silver. US: FREE FREE.